I’ve never made my own broth before. Looking at your instructions though, it doesn’t seem like it would be too much trouble to do. Plus, I love that it can be done in the crock pot. Have a bad viral invasion in my tummy, everything I eat, turns to water….. Hope this will help… Should I strain the broth? Sorry you’re under the weather! 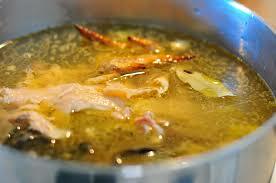 Broth is a good food for illness, stomach or otherwise. It never hurts to take it slow: allow your body to rest (digestion takes a lot of energy which could be used fighting that bug). You could try a tablespoon or so of broth, then if all is well, half an hour later try a 1/4 cup. Listen to what your body is telling you, and be patient. Sometimes after an intestinal bug I find it helps me to take some digestive enzymes and/or probiotics…kind of prime the pump again. Just some thoughts, and of course I’m not diagnosing or trying to treat you; talk with your Doc for that!